Are you a rental property manager? Do you feel overwhelmed with your current tenants while trying to follow quality leads? Running a property means staying on top of things, but it doesn’t mean you can’t have any help. Property management software will help you get organized and stay on top of things. Being in charge of a property means not only taking care of your current tenants, but growing your rental business. With the right property management software, you can make renting easy. Here are a few of the many ways that you can get organized with a property management software like NowRenting. Writing up leases and collecting rent can take up a lot of your time when managing properties. Along with having to do all of the work, you also have to keep track of the paperwork and checks. NowRenting helps you spend less time managing your tenants or coming up with new rental lease agreements. NowRenting’s property management software takes care of new rental lease agreements while properly organizing and saving them in case they are needed later on. You also give tenants the option to pay rent online giving both you and them a whole new level of convenience. Proper communication is essential between property management and tenants. Not being able to get in contact with your property manager or not being able to get in contact with your tenants can cause unnecessary stress and problems. With NowRenting, there is no need to worry about communication. All business communication is streamlined through a single inbox. 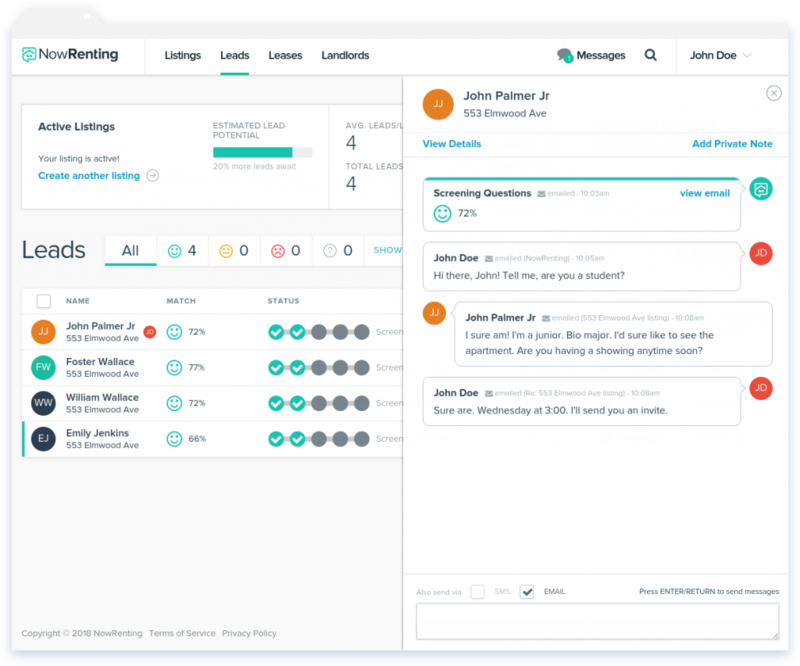 This gives property managers a way to collect all leads and communication with tenants into one easily managed inbox, eliminating the need to give out your personal phone number or email. When you’re unorganized, tenant screenings are the last task you want to tackle. Sifting through hundreds of leads can eat up a lot of your time and still leave you without a quality tenant. NowRenting does the grunt work for you by running background checks and screening hundreds of potential quality tenants. The property management software then selects the best of the best for you to choose from. This way you are able to find the best tenant in less time than trying to do everything yourself. Being a landlord, leasing agent, or rental management professional doesn’t have to be overwhelming and stressful. NowRenting helps you to stay organized by taking over tedious paperwork online, streamlining communication through a single inbox. With NowRenting, you can meet your tenants’ needs and free up yourself to focus on high-quality leads. If you are ready to take control of your rental business, contact Now Renting today.